I’m looking forward to being out in the warm sunshine today. Forecast is 74 degrees. Just a few weeks ago I was neck deep in powder skiing. Welcome to Utah. I have my season golf pass and I’m now 37 rounds away from breaking even on it, hehe. First round a week ago was an 80 after a plugged lie in the 17th bunker. I was playing a new ball and with winter rust and muscle atrophy from not swinging a club in months, I’d lost some distance. Today I don’t expect to light it up, except perhaps making more putts. I’ll be going through the giant pile of stuff in my office before I take off for the course to see if there’s anything I can start testing for upcoming reviews. Mostly, I hope to look as good as the golfer stud pictured in the stock photo to the right. 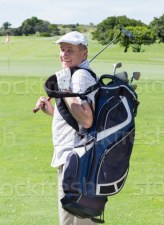 He’s got carrying a stand bag full of 4 clubs nailed.